American Airlines serving Miami-La Paz route arrives La Paz early in the morning at 5:30am. Having a small airport means crowded immigration lines, but fortunately, the they move fast. Unless you are from a country that has visa-upon-arrival option, you will be asked to wait in the main line and processed fast. But if you are a citizen of a country (ex: U.S., European Union or Canada) that has the visa-upon-arrival, you will be made to stand in the same immigration line as others, but will pay your visa fees the first time, then fill a form (while standing in a corner) and again stand in line for immigration. The bags arrived fast on the belts and having reached early on a winter morning, it was quite cold outside the airport. Before heading out, I stopped by the currency exchange window and surprisingly, the exchange rate at the airport was decent, unlike other airports where you are robbed! My hotel had informed me that someone with my name tag will be waiting for me outside the airport for a ride to the hotel, which didn’t happen! So hailed one of the many taxis right outside the airport for a 30-minute ride to the city center. Most taxi drivers will charge the same rate from La Paz airport to the city center – which essentially means anywhere near the Prado (main street), but if you are going to Zona Sur, then be prepared to spend more. All costs are for the taxi and not per passenger, so ask your fellow plane-passengers if they are heading towards the city center, and split the costs. Also depending on the time of day or night, the rates may vary a bit. For example, the early morning taxi from airport to city center was Bs 70 ($10), but the one from city center to airport in the evening was Bs 50 ($8). 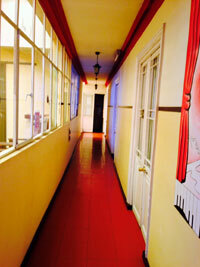 Looking for a hostel to party? Then this is your place. Located in the heart of the city, minutes away from Prado (main street in La Paz), Loki Hostel is the perfect combination of fiesta and siesta. Secured entrance and English-speaking staff gives them additional points, but don’t rely on the airport pickup service they offer! Having reached La Paz airport at 5:30am, we had setup the hostel for a pick up for 70 Bs (~$10). No one showed up at the airport with our name tags and no one answered the phone call! The hostel has a reception lobby at the ground level, rooms on first and second level and a huge bar/dining area on the first level. This is where they play loud, blaring music until wee-hours in the morning. The second level has posters at every corner saying “Shh after 10pm”, but who is enforcing that? No one! Rooms are good sized, with no bathrooms attached. Each floor has about 4-5 common bathrooms for use, that has hot showers. Beds are comfortable and the hostel serves free breakfast. Although mentioned on their website that towels are included in the rooms, they are not! Having read numerous posts about altitude sickness and how one should take it easy on first day in Bolivia, I decided to visit few of the main sights and take it easy getting used to the world’s highest capital city, at 3,650 meters (11,975 feet). 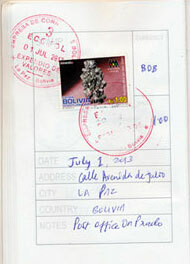 First stop was at the central post office to get the city postal stamp on my Postal Stamp Travelogue book. Located on the Prado, the post office is a 7-minute downhill walk from Loki Hostel. Most of the sights in La Paz are located around the main drag called Prado, but the official name of the street can vary, mainly called Avenida 16 de Julio. This is where all the businesses are located and is considered the lowest point in La Paz, with all the by-lanes going uphill from here. Walking north on the Prado, first stop was the Church of San Francisco, massively standing in the square (Plaza San Francisco), is also one of the main ‘meeting spots’ for locals. 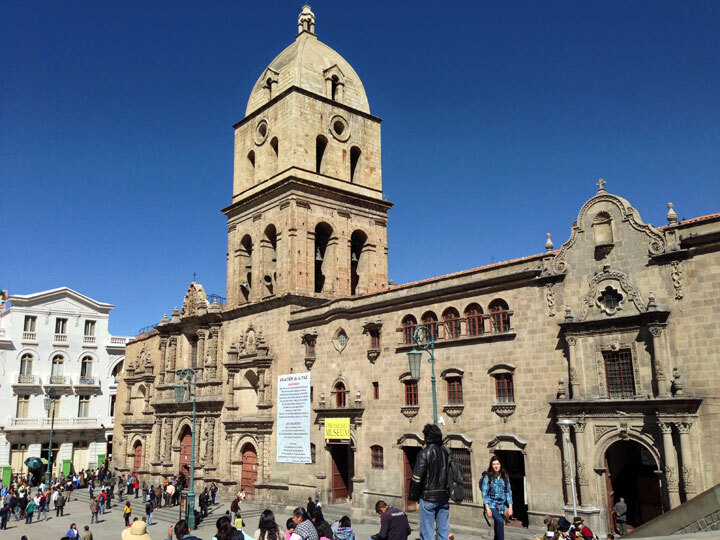 This is the most important colonial religious building of La Paz, consecrated in 1784 and suffered several architectural modifications since then. The interior of the basilica is very dark, badly illuminated, which is a pity since the pulpit and eleven altars covered with gold plate are worth a closer look. Photography is not allowed, not even without flash, which is a bit absurd considering that visitors of the church are mainly tourists, not local religious people. Outside, the basilica has massif walls, only one tower (the other one was never built) and an outstanding stone portico with strange figures. The museum, craft stores and the temporal exhibits are worth the visit. The price of admission to the Museum of San Francisco includes a private tour guide (meaning, we walked in and were immediately assigned an English-speaking tour guide), and this tour was excellent! We learned much about Bolivian history, heard many interesting tales, and, of course, saw lots of religious paintings. There are also interesting things from and about the revolutions in Bolivia. The tour takes you up to the roof of the church, and the view of La Paz is amazing. For part of the day, your tour ticket allows you to enter the tombs in the church. We did not do that because it was only open in the afternoon. Right next to the Iglesia de San Francisco is the well-known Sagarnaga street, famous for the cheap souvenirs. Walking uphill on this street, you will find everything from music to jewelry to all kinds of textiles, alpaca, Llama sweaters, carpets, handicrafts, postcards, t-shirts or just about anything you’re looking for. Don’t think the street vendors are cheaper than the stores, though. Do some comparison shopping, and haggle a little over the price. Remember that too much haggling is considered rude. Cheaper stuff is just three blocks away. Turn right at the first block on Calle Linares and you will be at the Witches’ market (El Mercado de las Brujas and La Hechiceri), with llama fetus hanging on the entrance of the shops. 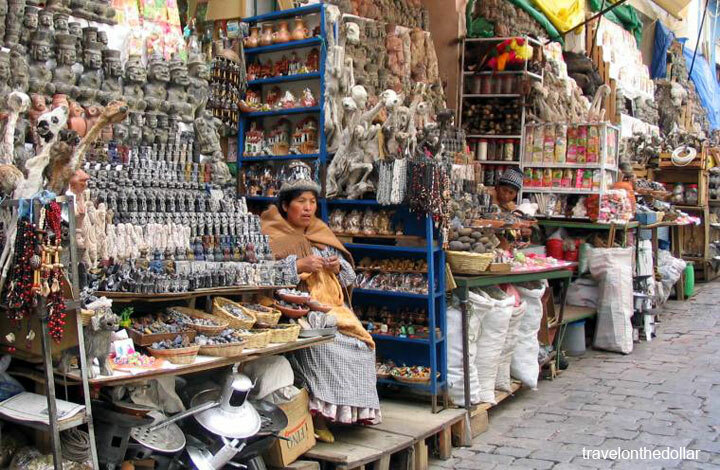 Run by local witch doctors known as yatiri, the shops have potions, dried frogs, medicinal plants like retama and armadillos used in Bolivian rituals. The yatiri can be easily identified by their black hats and coco pouches containing amulets, talismans and powders that ensure luck, beauty and fertility. Most famous of all the items sold in The Witches’ Market are the dried llama fetuses. These llama fetuses are buried under the foundations of many Bolivian houses as a sacred offering to the goddess Pachamama. Fancy spotting locals, and tourists alike? Then this is where the city comes to a lazy stop. 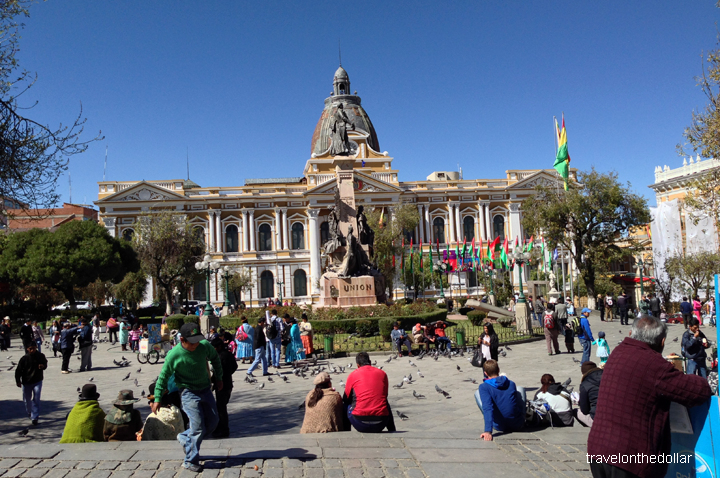 Again, uphill east from Plaza San Francisco lies the main square of the city – Plaza Murillo – that has two most visited sights in La Paz – Presidential Palace and Cathedral, and the best meeting spot for locals. The square is really laid back with families gather to slurp on the ice-cream sold by the street-side vendors, or just catch up on the latest news or gossip. The 1835 cathedral is an impressive structure with its high dome, hulking columns, thick stone walls and high ceilings, is overpowering, but the altar is relatively simple. Inside, the main attraction is the profusion of stained-glass work. Photography is not allowed inside the Cathedral. Beside the cathedral is the Presidential Palace, and in the center of Plaza Murillo, opposite, stands a statue of President Gualberto Villarroel. In 1946, he was dragged from the palace by vigilantes and hanged from a lamppost in the square. Interestingly enough, Don Pedro Domingo Murillo, for whom the plaza was named, met a similar fate here in 1810. Walking sort-of downhill from Plaza Murillo to the hostel was a respite from all that ‘hill’ climbing. Stopped by Alexander Cafe for coffee and lunch (plus free wi-fi) and realized that I was falling for the altitude sickness; so feeling nauseous and sick, I dragged myself up the two floors to my room for a long nap. Past sunset, I walked to the nearest cafe I could find on Prado, called Dumbo, for a good meal before calling it a day. Note: All values in USD, unless otherwise mentioned, are approximate and based on the exchange rate at the time of publishing. Each cost is for one adult. The exchange rate at the time of publishing is assumed to be USD 1= BOB 6.9.